Safe Routes to School (SRTS) programs are part of the solution to increase physical activity and improve unsafe walking and bicycling conditions while reducing the number of cars on the road. 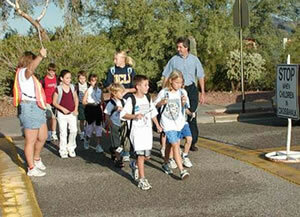 The school setting provides a unique opportunity to encourage walking and bicycling as a way to travel to and from school and, especially for walking, as an activity during the school day. This holds the potential to reach the vast majority of children who regularly attend and must travel to school (Tudor-Locke, Ainsworth, & Popkin, 2001). Walking does not require special skills or expensive equipment, which makes it feasible for most of the population. School-based walking programs have the potential to address several of the most commonly cited barriers to physical activity, including motor vehicle traffic dangers and lack of a safe environment (Centers for Disease Control and Prevention, 2005). Walking and bicycling to and from school can contribute towards the development of a lifelong habit and community-wide norm of incorporating physical activity into daily routines. Significant moderate to vigorous physical activity has been associated with active commuting to school (Bassett et al., 2013).